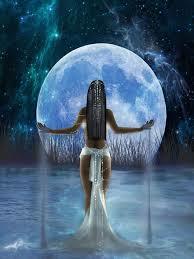 The Moon is a fast lady, as she speeds through the 12 signs of the zodiac on a monthly basis. One of the primal forces within this archetype is the search for security and yet, this ongoing rapid-fire change of ‘face’ contributes in creating the insecurity that the moon, representative of the emotional nature, is seeking to circumvent. But that is the way it goes with emotions. They are the rolling hills in our landscape, causing us to bump along whilst looking for even ground. If you have kept up with this bi-monthly blog on the Moon and her escapades, you have probably realized that this flighty traveler never spends more than about 2 ½ days in each sign. She barely gets used to one energy and off she goes, speeding into the next. This is very much like our own human quest for that place of security on an emotional level. We may just be getting used to something when suddenly we pick up and move on to something entirely different. And when you examine the order of the elemental and modal energy of the zodiac, it is clear that each subsequent sign is very different to the one preceding it and following it. So, we move from fire to earth to air to water and we do so without exception. That is the inimical order of the flow of energy. It always begins with the fire of spirit where inspiration is born, then moves into the ground of earthy containment where it is fully embodied; is formulated and articulated in the intellect via the elegance of airy energy and finally embraced by the emotional self via the intensity and absorption of watery energy. But this is what it means to be human. We shift constantly. We alter and amend. Through this constant adjustment, we grow (hopefully), expand and evolve into beings who are more than we were just a moment before. Tracking the Moon in her monthly transits clarifies to us the beauty of the natural order, the necessity of adaptability and the ongoing attempt on our part to reach beyond the scope of our grasp, to make that leap into uncharted territory, to live with eyes wide open always. This is the first Full Moon after the Summer Solstice and it falls along the axis which is the Moon’s natural habitat. Capricorn is the partner sign—polarity point—to Cancer where the Moon most comfortably (though not necessarily effectively) resides. In Capricorn, the Moon finds her ground. This is the energy of EMOTIONAL EXPERTISE & MANAGEMENT. If you were born with the Moon in this sign, you are one of the executives of the zodiac, no question. In Capricorn, the emotions are well-managed, decisions are deliberated and executed with precision and care. No big drama here. Rather, all challenges are approached with steely nerve and nothing, absolutely nothing is left to chance. The chaos that can something prevail with the undisciplined energy of the Moon in Cancer is scooped up and put securely into a box where it cannot cause havoc. Traditional Astrology once designated the placement of the Moon in Capricorn as a debilitation, suggesting something less than favourable. Language here is vitally important. Think of it this way. When we have a disability or inherent challenge built into ourselves, we have two choices. We can give up and become a victim or we can rise to the challenge and become a victor. If you were born with the Moon in Capricorn, your potential is that you will make good use of your disability, turning it into an ability to control and manage your emotional nature. Well-managed emotions are the secret weapon in any situation. Why? Because most folks don’t manage their emotions well. Actualized souls with Moon in Capricorn can become beacons of light to those in need, providing care, counsel and comfort. In terms of healing, Capricorn energy is that which can minister to the masses. It’s the kind of energy that can go beyond the personal and touch many. Capricorn defines the very nature of reality and provides, if implemented proactively, the rule of law that serves the needs of all. Of course, there is always a shadow to be mindful of. When the rule of law becomes partisan in nature or seeks to constrict rather than empower, Capricorn has descended into the murky territory of mind-control, even fascism. And, by the way, this can happen on all spectrums of the political scale. When someone tries to tell you how to think, how to speak, how to act and disallows civilized dialogue, they are fascists. As a society, if we cannot find a way to live harmoniously all the while dissenting with each other, we are doomed. The next time someone says something that YOU think is ridiculous or outrageous, stop for a moment and at least try to see it from their point of view. You don’t have to agree, but you do have to ALLOW. Another shadow element contained within Moon in Capricorn is the proclivity to emotional coldness, a brutality of feeling that disregards the personal. Everything is factored down to a pro/con type of check list and decisions are made devoid of human compassion. Here, again, the DISALLOWANCE for alternatives is highlighted. So, watch this tendency in yourself closely, at all time, like a hawk, if you were born with the Moon in Capricorn. This Full Moon has several interesting energetic dynamics. Firstly, Mars, the Warrior archetype, is beginning his retrograde through Aquarius and he will remain retrograde until the end of August by which time he will have moved back into Capricorn. A retrograde Mars is reflective of the same kind of externalization as a retrograde Mercury. Action Interruptus! So, be mindful of the potential for incomplete action, for stalled action. Be willing to make corrections, even look for the opportunity to correct. Review, re-consider and re-invent. Aquarius is the archetype of the future and when Mars races through this energy, he is eager to create that which is not yet fully formed within the collective. This few months of retrograde motion provides us with plenty of space to explore the dream, to re-vision the future and adapt both individually and collectively. So, don’t etch your plans into stone, write them in the sand. This particular retrograde happens at the south node so we are urged to delve into memory to re-create the dream. Remember and review! If you want to change your future, you must find a way to re-vision your past. Heal the wound and save the self. Secondly, Chiron, now in Aries, squares the lunation, suggesting the need to find ways to heal the wounded self, to take assertive action in connection to any insecurities that are present within the tender self. A slowed down Mars facilitates the energy of consideration and reflection. Use it to dig deep and discard anything that is preventing you from being who you truly are. Uncover the inner potential and give yourself permission to BE. Always with compassion, consideration of others and love. Finally, with Saturn aligned to this Full Moon within one degree, this lunation is laced with the steel of resolve. We feel the need to stand in our power, to hold to the right according to our understanding of what that right might be. We are infused with the grit of survival whatever we are facing. We feel the energy of determination as we hold firmly to the wheel of our ship. We are the master of our destiny, the captain of our ship! You have, deep within yourself, the ability to stand in your own truth, to be powerful and strong. Every day is an opportunity for you to embody this power, to seize the moment and show anyone who is watching you who you truly are. But as you own your own ability to be the master of your own destiny, always remember that you are merely a reflection of something much grander, much more noble than anything on this earthly realm. Be the masterful instrument of that nobler element and as you hold to your own personal power, never forget that it comes from a source far removed from the concerns of human toil. Lean into the arms of spirit for it is from that place that true sovereignty originates. And she smiles down on me.